20 cm lxii, 116 p. : ill. Previous ed. of this translation: London: Hart-Davis, 1965. The slamming of the front door at the end of A Doll's House shatters the romantic masquerade of the Helmers' marriage. In their stultifying and infantilised relationship, Nora and Torvald have deceived themselves and each other both consciously and subconsciously, until Nora acknowledges the need for individual freedom. 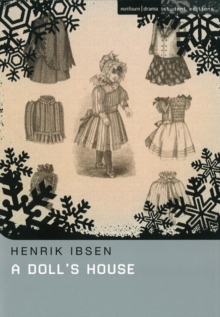 A revised student edition of classic set text: A Doll's House (1879), is a masterpiece of theatrical craft which, for the first time portrayed the tragic hypocrisy of Victorian middle class marriage on stage. The play ushered in a new social era and "exploded like a bomb into contemporary life". "Meyer's translations of Ibsen are a major fact in one's general sense of post-war drama.